Student & ECR Activities » ASM Communication Ambassador Program » ASM Communication Ambassador Blog » CO-ADD - Do you have the next antibiotic? But the *REALLY* exciting stuff was yet to come… I was greeted by a friendly Dr Alysha Elliott who escorted me up to where antimicrobial compound screening magic happens: The CO-ADD program. CO-ADD is the “Community for Open Antimicrobial Drug Discovery.” It is funded by the Wellcome Trust and University of Queensland to fill the gap in antimicrobial compound discovery. The antibiotic pipeline is broken: there has been very little development of new classes of antibiotics and an increase in antimicrobial resistance. Pharmaceutical companies have not really had the return on investment they would like to see and so have been pulling out of the field. Enter CO-ADD. CO-ADD takes a “back to the future” approach, returning to some of the principles of the golden era of antibiotic drug discovery. At their core is the principles of collaboration and openness which had led to many of the golden era’s successes. When around 15,000 compounds are synthesised each day (based on the CAS registry data), there is an enormous volume of potential that ends up collecting dust on shelves in chemistry labs. Rather than being forgotten in some store room, CO-ADD asks that novel stable compounds be sent to them for antibacterial and antifungal screening. 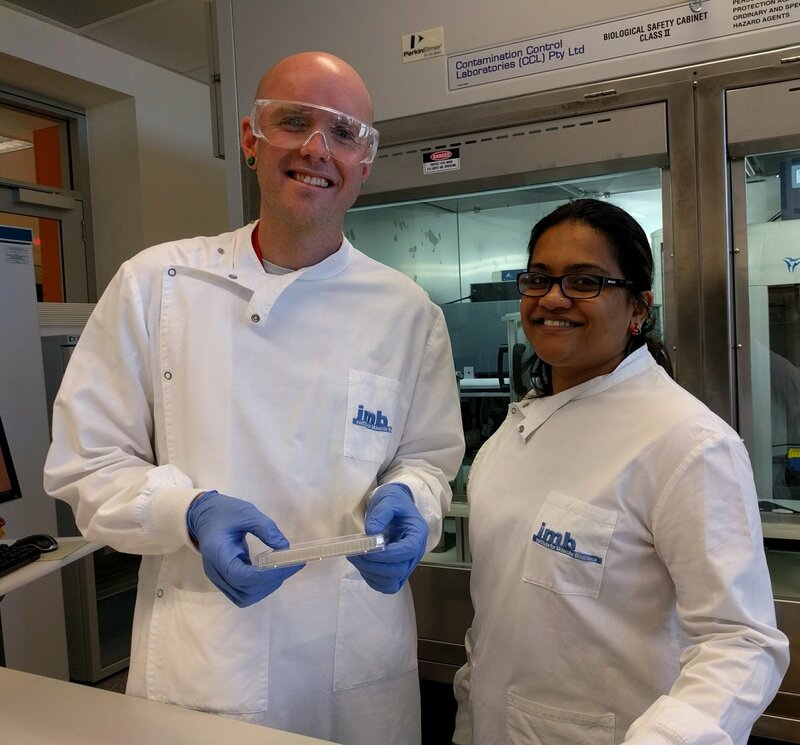 CO-ADD has 15 people from a multidisciplinary team including microbiologists, chemists, informaticians and outreach professionals working with the thousands of compounds they receive. Over 18 months CO-ADD has received over 120,000 compounds from 35 countries. Of these around 80,000 have already been screened. The confirmed hit rate is an excellent 0.5% for Gram positives, 0.3% for Gram negatives and 1.1% for fungi (all with selective toxicity over mammalian cell lines) – that’s about 30 times higher than previously published comparable campaigns. A strength of the program is the consistency in methods, allowing easy comparison between tested compounds. Compounds are first screened against key ESKAPE organisms (E. coli, K. pneumoniae, A. baumannii, P. aeruginosa, S. aureus (MRSA)) along with the fungi C. albicans and C. neoformans at 32 µg/ml. Where there is a hit, further testing is undertaken, including dose-response antimicrobial assays, cytotoxicity assays and purity confirmation. Further screening can then be undertaken, including a panel of MDR and clinically-isolated organisms. It’s Free. What’s the catch? Who can be involved? Testing is free. IP remains with the collaborator. Collaborators can be research and academic organisations anywhere in the world, both big and small. They can be from developing or developed countries. Collaborators are asked to send in stable, novel compounds at 95% purity or higher, dry or in DMSO. It might be 1 compound; it might be 100,000. For labs sending in large numbers of compounds, pre-coded boxes and vials are freely available from CO-ADD. Results remain confidential for 2 years allowing collaborators to patent or publish, after which all compounds are added to an open access database. Collaborators need to accept the CO-ADD terms and conditions (or in special circumstances where necessary may negotiate an MTA). Having open data allows others to analyse what has previously worked or not worked. This helps researchers with dereplication and may lead to the development of something similar to the “Rule of 5” used in other high throughput human drug screens. Spread the word, especially with chemists you work with. All the details on getting started are available at www.co-add.org …and it is really easy. This free community event at UQ’s IMB (St Lucia, Brisbane) will be held during World Antibiotic Awareness Week and includes exciting speakers such as Olympian Fiona Albert and Paralympian Chris Bond OAM. The next new class of antibiotics may be sitting on your lab bench.